Something had to give when Mousehole visited Porthleven with both sides boasting a 100% record, but it was the home side who rode their luck and made the most of their chances in a dramatic local derby to edge the victory and go to the top of the West Division table. Mousehole put in arguably their best performance of the season with some scintillating periods of attacking football, but they missed a penalty, hit the Porthleven woodwork three times, and forced ‘keeper Jason Robertson into a number of outstanding saves, while gifting The Fishermen all three goals through unforced errors at crucial times in the match. 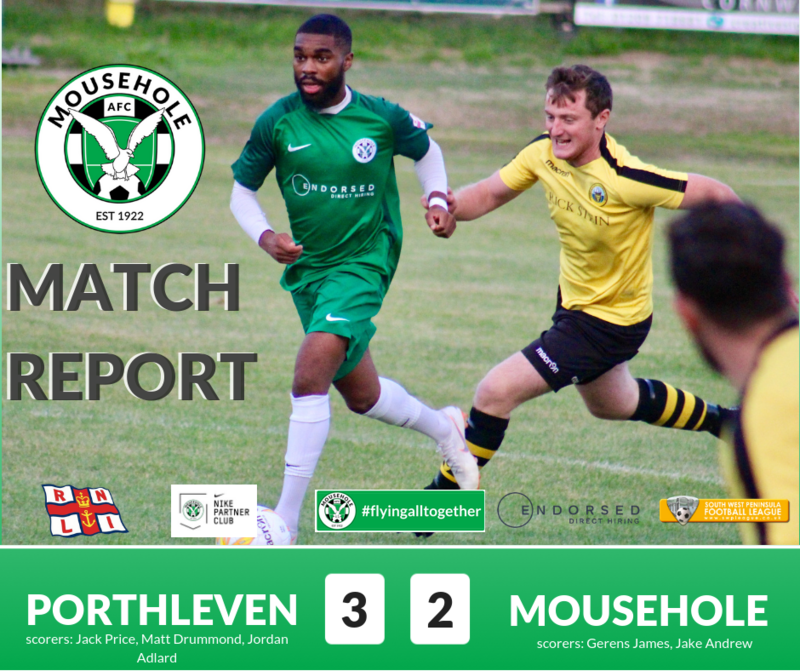 Mousehole signalled their positive intent when Craig Wilcox and Will Vouama – the latter returning after attending higher-league trials – fashioned an opening on three minutes from the right of goal but Steven Ziboth had his shot cleared off the line. Porthleven went into an unlikely lead in the 5th minute when Calum Elliot slipped on the edge of the box in possession of the ball, leaving debutant Jack Price to take advantage of his good fortune to run on unopposed and score a simple goal. The lively Craig Wilcox came close to equalising in the 7th and 14th minutes, firstly with a 20-yard shot just wide of the far post and then drawing a fine save from ‘keeper and captain Jason Robertson, who turned out to be Port’s saviour on the night and was named as their man-of-the-match. As the first half progressed The Seagull’s passing patterns and incisive forward movement pegged the hosts back in their own half for long periods. After Steven Ziboth had been hacked down on the edge of the box after a typical direct run, Calum Elliot’s free kick on 26 minutes struck the near post and spun out to safety. And then, three minutes before half time, Mousehole were awarded a controversial penalty when ‘keeper Robertson objected to Gerens James’ close attention by pushing him to the ground, with referee Mark Hosking consulting his assistant to confirm the decision. However, the ‘keeper atoned for his moment of rashness and earned his side a reprieve by beating out Steven Ziboth’s penalty to preserve The Fishermen’s lead. And that incident became even more significant when the visitors made the worst possible start to the second half, with Port doubling their lead within a minute of the resumption. Mousehole conceded possession deep in defence on their left, and a whipped-in cross was headed home by Matt Drummond from very close in. To their credit, Mousehole regained the initiative and on 53 minutes Gerens James just failed to make proper contact with a good headed chance from a Paulo Sousa cross. In an ambitious substitution on 54 minutes, defender Ryan Andrew was replaced by striker Jake Andrew to partner James up front, and within four minutes the twin strikers had put The Seagulls back on level terms. A swift defence-splitting move by Craig Wilcox and Jake Andrew down the right created the space for Billy Curtis to pinpoint a cross into the danger area and Gerens James nodded in for 2-1 in the 56th minute. In the next penetrating move, this time down the left, Paulo Sousa darted 30 yards and his low centre was driven first time in off the crossbar by Jake Andrew for a spectacular equaliser on 58, much to the noisy delight of the large away support. With Mousehole now well on top, Robertson saved superbly from Steven Ziboth and Gerens James, but all the previous good work was undone in totally unexpected fashion in the 64th minute when in a rare and harmless-looking Port attack, Paulo Sousa clearly handled a cross, and former Seagull Jordan Adlard converted the penalty to make it 3-2. The Seagulls continued to carve out regular chances, creating the expectation of at least a repetition of last season’s pulsating 3-3 draw. Both Steven Ziboth and Gerens James hit the same upright and James was inches away with two other efforts. But Porthleven’s defence stood firm in the face of a barrage of attacks though they still had Robertson to thank for blocking a Ziboth shot from point-blank range after the wingman had tricked his way at speed past several defenders. At the other end, the home side could have made the game safe with a breakaway in the 87th minute, but in the end they will have welcomed the sound of the referee’s whistle following five minutes of added time. Rarely will Mousehole play such exhilarating football for no points reward, and equally Porthleven will be satisfied with a win from only a fraction of the possession and chances. After four games played, Mousehole go into the home league game against St Dennis at Trungle Parc this Saturday (8th, 3pm) in third place, three points behind Porthleven and Liskeard Athletic, and on level points with Penzance but with a better goal difference. Porthleven are at home to Dobwalls, while Liskeard are at Holsworthy and Penzance at St Blazey. 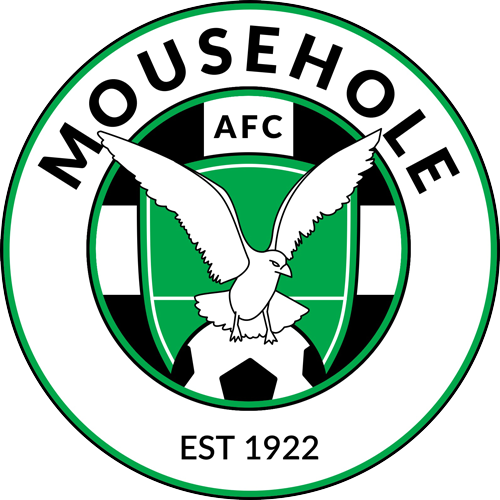 Mousehole v Porthleven: Sam Shulberg, Ryan Andrew, Billy Curtis (captain), Calum Elliot, Paulo Sousa, Max Hill, Luke Hunter, Craig Wilcox, Gerens James, Will Vouama, Steven Ziboth. Scoring: Jack Price 5 (1-0), Matt Drummond 47 (2-0), GERENS JAMES 56 (2-1), JAKE ANDREW 58 (2-2), Jordan Adlard pen 66 (3-2).